Enjin's powerful store module not only accepts a huge range of payment gateways, but can also be setup to function around a fully point based website system. Setting up a point based system is quick, easy, and beneficial in a variety of ways. All of which we'll explain in more depth throughout this article! Website points are similar to virtual currency or reputation, and can be earned or purchased using a variety of methods. The benefit of using points is that is promotes website activity, good behavior, and gives the user a more rewarding experience and goal to work toward. Points are accumulated per user account, and can be later used to purchase actual items on your store in place of currency. In this article, we'll detail exactly how to setup your store to function around points, as well as showing you the best side module/features to help your users get the most out of your new point based website system! We'll also include some handy point-ers at the end so you don't miss a trick! Note: This guide is just an overview of the point based aspects of store management and administration. To learn the baics of setting up DonationCraft, check out our Help Center! First things first. We need to get our Store Module "point ready". 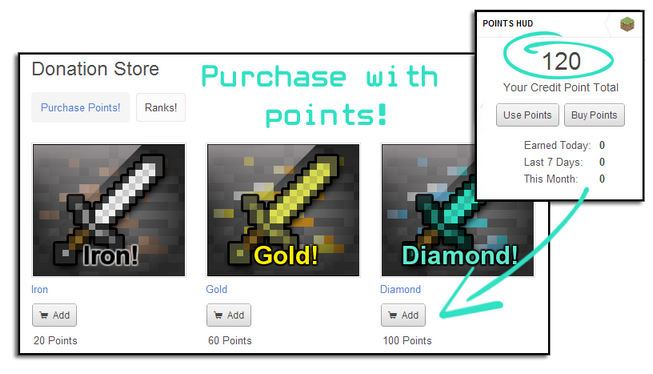 This means enabling points to be used as currency, and setting up some items which can be purchased with points. Just to note, server commands will be executed exactly the same as a regular store purchase, so don't fret. Your server will keep on ticking perfectly fine even with a point based store (It may even tick smoother than ever before!). Firstly, we'll need to create some categories and items. To do this hit the 'Add Category' at the top of your store module admin section. Check our our help center guide for further information on adding categories to DonationCraft. Since we're using points as currency, a useful feature to unable under the new category is 'Enable cumulative discounts on point based items'. For information on cumulative discounts, check out our video tutorial here! Next, we'll need to add some items! This is where we'll set whether you can purchase with points or currency. When adding an item, leave the 'Price' field at the top at default 0.00. The option you want to look for is under the 'Credit points' section further down. You'll need to check the option 'Item can only be purchased with points', and set a 'Item Point Price' value. For example, in the image below, the 20 points is related to our Iron rank in the image above. Setup all the items/ranks you want to sell using the same settings (But of course with different Point Prices) and you should end up with Part 1 complete - A nice "point ready" Shop! Note - As stated, server commands are fully supported with points. You can set them up exactly the same as a regular store item. Check here for details! But how do I earn points, you say? Read on to find out! Earning points can be both easy and rewarding - exactly how things should be! Enjin provides a large range of features and modules to help users earn points. Not only that, points are a great incentive to encourage website activity, and even help in website promotion. We'll take you through the 3 best point earning methods so you can make the most of your new website system! One of our most popular modules..and for good reason! Vote for diamonds is not only a great way to get your community engaged and earning credit, but an awesome utility used to promote your server and website itself! Check out our guide here for more information on how to setup this feature! So how do users actually earn points with this module? Well, it's not just a cool standalone feature, it's also jam-packed with powerful additions, such as rewards and reminders. The section we'll want to concentrate on in particular will be the 'Rewards Tab', highlighted below. To create a Reward, click the 'Create Reward' option. Add a name, description, and make sure to set a value under the option 'Add Credit Point To User'. Once your Reward is created, we'll want to create a Condition for the Reward. A Condition is the criteria that needs to be met before a Reward is issued to a user. For example, in the image below our Condition is 'User voted on ANY Selected lists 14 times, in the last 14 days'. You can modify the criteria however you want, just make sure to select the Reward to issue under the 'select reward to give user box'. Enjin's automation system is an extremely powerful and flexible feature that gives you an incredible range of options, allowing you to automatically hand out (Or take away!) points to users. Setting up automations is a great method to allow your community to dynamically grow. Not only will users have constant goals to actively work toward, you won't need to lift a finger in the process! Automations can be accessed from Site Admin -> Automations. 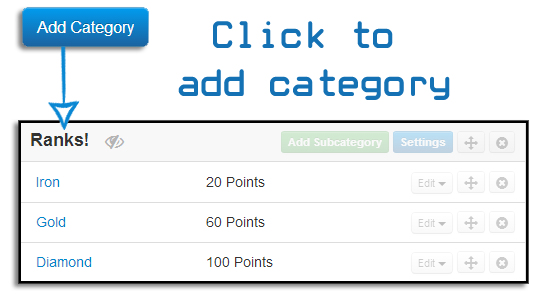 Below is an example automation setup, giving users 1+ point credit for a variety of website achievements. The option 'Only trigger this automation once per user account' is useful to prevent users abusing the feature for points. Ie. A user may remove their posts after reaching a posting goal (Say, 100 posts), so they can achieve the condition again. Make sure to check this if required! For further information on automations and conditions, check out our help center and video tutorial. A final method, and probably the quickest way to earn points, is to just buy them from the store itself! The options that sets them a part, and what you want to look for when adding, are under the Credit Points section. You'll want to make sure to add the correct +points value to the 'On Purchase Add Points' box, as well as checking the option below 'Request user to login for purchasing this item to gain points'. There isn't much to tell when it comes to spending points. Just head on over to your websites store and fill that basket up! There are a few useful website features, however, that can help both the user and administrator keep track of points, point spending, and point earning. The Points Display module is a really simply, yet incredibly useful, feature which provides a heads up display of a users current credit total, and data on their earnings. Giving your users a visual method of keeping track of points is vitally important, so make sure to include this handy little feature in and throughout your website. For Administrators, point details can be viewed, edited, or removed from the Admin -> Users section. Just find a user and select the 'edit' button to the right, and click 'Edit Credit points'. From here you can view more detailed statistics on a users points and usage. As well as the ability to add, remove or simply set a custom number of points. - Point Decay is a great additional feature which does exactly what it says on the tin! It can be accessed in the Admin -> Automations -> Points Settings section, and gives your website points a gradual (Or rapid) decay over a set period of time. This is useful to keep users active, as well as helping to clear down points associated with inactive user accounts. Read here for more information. - Make sure to send out daily reminders using the 'Reminder' feature instead your Vote for Diamonds module. - Try to use up all your plan Automations. These are great to keep your community active, and their options to earn points diverse. - Using Points instead of actual currency to issue server commands are one in the same. All settings will be identical, so don't worry! Ranks will not go amiss. - Our Help Center is a great place for additional information on all the topics covered here! - For Vote for Diamonds troubleshooting, check here. - For DonationCraft troubleshooting, check here. Create your guild/clan website today, and make use of all the great features listed above. Sign up for our awesome 14 day free trial ! I am concerned about the "Selling points" aspect. "You cannot charge real-world cash for in-game currency"
IMO, Even if you call them "website points" they are still considered currency since you use them to purchase items thru a store. And since you can have access to those points from within the game, then it's not far fetched to call those points an in-game currency as per Mojang's rules. We can argue all we want about it but in the end.... it's Mojang who will decide if what you propose is against the new EULA changes. Why dont you (Enjin) ask Mojang about it? Owen Hill provided his email address on his twitter account so we can ask him questions about what is or is not against the new rules. I would love to see Mojang say "It's ok, website points are allowed" but since server owners could still abuse and cause trouble going thru this so called "loop hole", I get the feeling they wont accept it. Time will tell!